Body Alignment | Creating The Perfect Paint Job | DH Automotive, Inc. Happy New Year everyone! 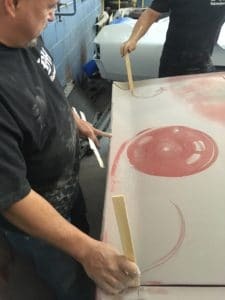 In this month’s edition in our nine part series, Creating The Perfect Paint Job, we’re going to take a look at Step Three: Body Alignment, which is almost always done at the end of the assembly phase and if done improperly can result in doing work twice or even more to remedy the problem. The first thing to consider before we get started is the direction of the body alignment. The general rule of thumb is to work from the rear to the front. Decades ago, I was working on a 64 ½ Mustang convertible and decided I needed to align the body up before finishing up the body work. I figured that most of the car was so called straight and it was just the fenders that needed alignment. To make a the long story short, it took me literally two weeks to finally realize that no matter how hard I tried to line up the fenders correctly, they would be pinched by the hood and doors. I needed to remove both fenders and start with the doors. The car is a 68 Mustang California Special coupe; the car has been stripped of all glass, chrome, & weather-stripping, and is ready for bodywork. The car is pretty clean, in the sense that, we can see no real damage from an accident or doing any stunt driving. 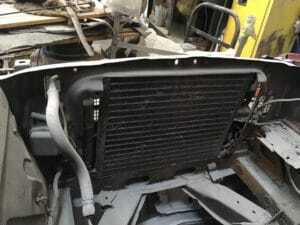 We know that that the front and rear lower valance will be replaced with aftermarket pieces. Hood and trunk have minor dings but overall very straight. Front fenders have cancer near the lower sections, so we decided to purchase new ones to save time with body work. The rocker panels are remarkably in good shape, just surface rust. We noticed that the driver door sags a bit and the hood right rear corner does not seem to lay flush when you close it. In order to correct these issues, we ordered a pair of left side door hinges (upper and lower) and a set of hood hinges. 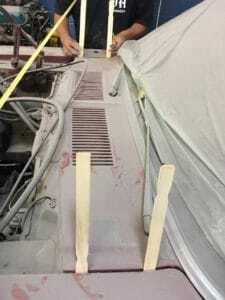 The rear quarter panels are ready for body work; we have received the fenders, valances, and hinges – now it’s time to start lining everything up. I like to start with the trunk lid by securing the 4 mounting bolts, stripping the trunk lid, and lock removed. The lock will be installed after paint and after knowing that everything lines up properly. I’ve applied one shim to the right side, I’ve loosen the bolts to align the trunk, and used paint sticks to get equal space on each of the sides. Once the trunk is completed I’ll move onto the door. Knowing the Mustang Coupe is a two door set up, I like to do the passage side first, then move on to the driver side. We know that the hinges are toast on the driver side so we swap them out. They are pretty easy to get at because the front fenders have already been removed. 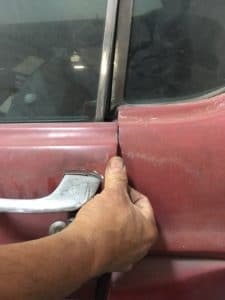 Unlike the trunk lid, the doors have the lock assembly still installed so I secured the doors by using paint sticks (breaking them into thirds) to get the door where I want it. I did this by slipping the pieces in between the door and the body making sure the door itself is level on the lower and rear section. The last section is to line up the front fenders and the hood. This is the most crucial and seems to be the most difficult for a lot of us. Getting everything to line up properly can turn into a nightmare, but with a few tricks this process can run fairly smooth. The Mustang does not have radiator support bushings and the support is welded to the frame. If the car you are working on has bushings, the first thing you want to do is make sure your radiator support is in good shape – this is the vertical frame “wall” that your radiator bolts up to. This also houses your voltage relay and all your lights, so if you have old worn out bushings which are located on either side, this would be the time to install new ones. Remember that the front fenders are bolted up to the radiator support so if that’s not secure you will run into all kinds of problems. Ok, now we begin take a deep breath and loosely bolt up both fenders. We first install all the necessary bolts by hand so that the fender can still be moved around a bit. Once both fenders are on the car, go back to the rear of each fender and begin lining up the gaps you want. 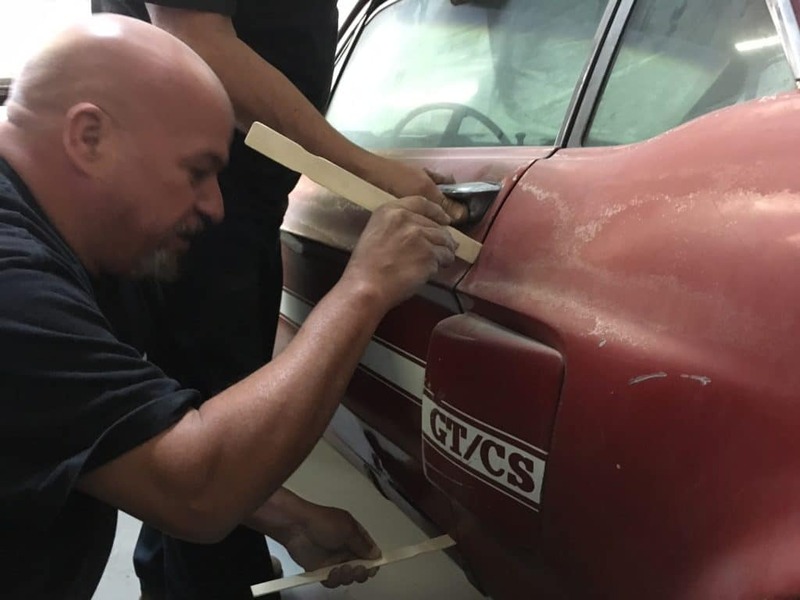 Start by using the paint sticks in between the fender and the front section of the doors. Next, secure the fenders up top which is near the cowl assembly. This is the grilled section that sits just below the front windshield (this houses the wipers and fresh air ducts) Once you have the desired space (even on both sides of the cowl panel), tighten them down. This will secure the rear of the fenders now (tricky part). Measure the distance from both fenders at the cowl panel, take your measuring tape, and measure out the same distance for the rear and apply it to the front of the fenders. You also want to measure across from each side in a crisscross pattern, as this will make sure that the engine bay is squared up. Next, we want to install the new hood hinges. Secure them in a neutral position to allow you to work hood once its installed. Make sure you remove the latch mechanism from the hood if you already haven’t done so. You will need to work with someone else to help manage and secure the hood. It will have two bolts on each side, and you have to crane the hood with your shoulder while each of you install the bolts. Make sure they are snug, but not too tight, so that you can loosen them to position the hood. You will repeat this process until the hood is where you want it. You continue them up to get the gap distance for the very last piece, which is the front lower valance. This can be fairly flimsy, so you need to mock up with four bolts to see how the piece lines up. Now that the body is completely assembled, go over all the panels one last time to make sure all lines are flush and the gaps are in unison. Open the trunk and hood and check how they lay once closed. Do the same with the doors, making sure to check if they don’t pinch the fenders. If everything looks good, the body alignment process is complete and you can take a load off. Next month we’ll go over paint removal and body work. In the meantime if you have any questions feel free to drop me a line I’m always glad to help!